Conversation running a bit dry with the extended family over Christmas? Well kick back with ESPNscrum's quiz of the year and see how many you can get. 1. Who took the 2011 IRB World Sevens Player of the Year award? 2. How many games did the Melbourne Rebels win in their debut Super Rugby season? 3. Injury ended Japanese winger Daisuke Ohata's career, but how many tries did he score during his 10-year Test spell? 4. What was the name of the assistant who failed to spot the change of ball in the lead up to Mike Phillips' infamous try against Ireland? 5. Who was voted 2011 Six Nations Player of the Championship? 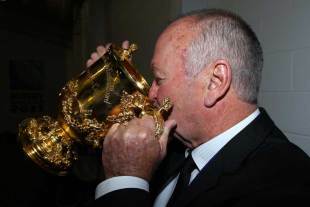 6. Who lifted the 2011 Six Nations trophy for England? 7. Who was Ireland's Ronan O'Gara playing against when he broke the 1000 Test point mark? 8. Who did Worcester beat in the Championship play-offs to earn promotion to the Premiership? 9. Who was named Aviva Premiership Player of the Year for the 2010-11 season? 10. Which two Bath Rugby stalwarts hung up their boots at the end of last season? 11. Name the two players who passed 100 appearances in the Heineken Cup in 2011? 12. Who did Toulouse overcome to take the 2011 Top 14 title? 13. Name the two players who notched hat-tricks for England against Romania in the 2011 World Cup? 14. Which countries had the oldest and youngest squads at this year's World Cup - and which group did they share? 15. In which match did Webb play against Ellis during the 2011 Rugby World Cup? 16. How many tries did England concede during their World Cup campaign? 17. Argentina will make their Rugby Championship debut against which side? 18. Graham Henry finally won the William Webb Ellis Cup with New Zealand, but what was his winning percentage as coach when he stepped down from the role? 19. Japanese fly-half Ryohei Yamanaka failed a drugs Test in the lead up to the tournament, but what was his reasoning? 20. Who captained Oxford to Varsity triumph in 2011 against perennial rivals Cambridge and who did he play for in the Premiership? 0-5: Were you watching rugby league in 2011?